I cut and pieced these blocks during the retreat. I bought a few extra fat quarters of green from the boat at a Little Bit of Lollys to use in the blocks. My favorite quilts are ones that have either fabrics from friends or fabrics that I've bought from a special place. I've started to put the corners on the blocks. This is the quilt I'm planning to make from the book When The Cold Wind Blows. There are parts of it I really like and some that I don't so I will be making my own version of it. Today is my birthday, and I'm leaving on a bus trip bright and early tomorrow morning to the quilt show in Paducah, KY. I'll try and post from there on my phone, but if not I'll have photos when I get back. I hope you find some time to stitch today. I've been back home from the retreat for a few days but have been helping take care of a sick cat and trying to get her to eat. She spent the day at the vet's office yesterday so hopefully she will start improving soon. Dear Jane made entirely of music fabrics. Love the secondary design of this one. Quilt made using 3 inch swap blocks. Another gorgeous quilt using 3 inch swap blocks. The center of the blocks in this Christmas quilt are from another 3 inch block exchange. The rest of my retreat photos are posted here. In the last couple of days I've been doing some sewing, shopping and walking around town enjoying the sunshine and the sights of Shipshewana. This is mostly Kaffe Fassett and Phillip Jacobs fabric. There are so many gorgeous fabrics that it takes several trips back to Lollys to decide what to buy. 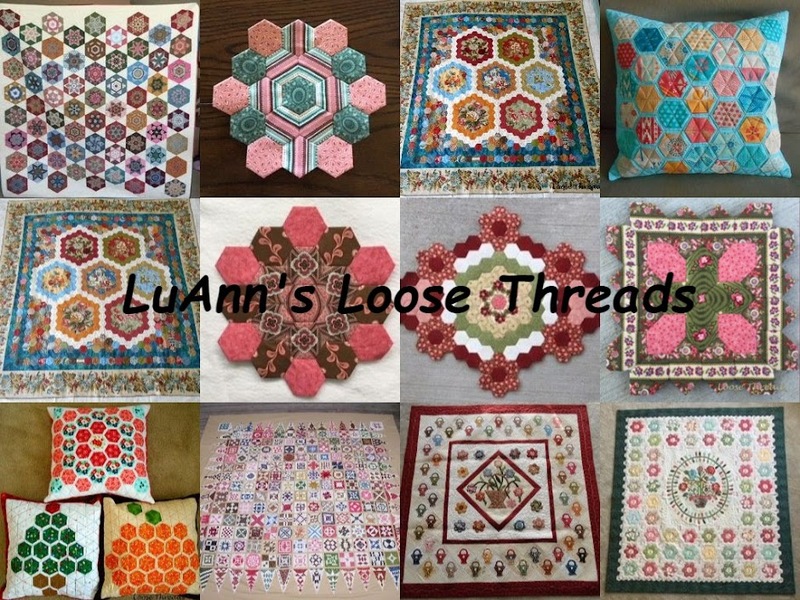 Here is more fabric with a nice selection of Kim McLean patterns. This is not all of the Kaffe fabric at Lollys. This is the window display at The Cuddle Shop in the basement of the Davis Mercantile Building. Cuddle has the same look and feel as minkee. Any quilter that has been to Shipshewana knows about "the boat". The boat is filled with fat quarters, and you never know what you are going to find there. This time our group has a coupon to purchase our fat quarters for $1each through our entire stay. I've been boating twice so far this trip. This shop is filled with sale fabric from Lollys. Yoders has even more fabric. Here is a cute display of rick-rack in Yoders. That's more fabric in the background. Both Yoders and Lollys has some yarn, too. The Amish were in town today. An antique store; love the architecture here. Beautiful wooden cabinet inside the Blue Gate with all kinds of things for sale. Some of the Amish homes had their laundry hung out to dry. This one had some pretty quilts and blankets out today. I stopped at Yoder's Popcorn on the way into town. I browsed on the hardware side of Yoder's store and saw these shifty eyed cat clocks. I saw this sign when I stopped at the Kitchen Cupboard for a latte. Then I looked at some fabric at Lolly's. Beautiful quilts at The Lang Store. Just finished dinner at the Blue Gate. I brought a piece of raspberry cream pie back to my room for a bedtime snack. So far the only down side of the retreat is that it is cold and windy. I have even seen quite a few snow flurries this afternoon. Tomorrow afternoon the sewing room doors open, and we begin stitching (hopefully). More tomorrow. Hope you are finding some time to stitch. Thanks for stopping. I just finished two Valentine Heart Table Toppers this weekend. I was working on these before Valentine's Day when a small cutting mat slid underneath one of them and my sewing machine stopped working. Now they are ready for next year. To the right you can see the beginning of a granny square crochet project that I've been working on. Here is a closer photo that shows the machine quilting a bit better. I'm using the Heart Paisley design by Leah Day. My peony bushes have huge buds already (complete with ants). This is the Indiana state flower and usually doesn't bloom until sometime in May so we are definitely having an early spring. This is my latest photo of my grandson, Daniel, taken last Wednesday at 2 weeks old. I hope you are having a nice Easter weekend with family and friends and finding a few minutes to do some stitching. This Dresden Plate block has been on my design wall this week. I decided to make it into a table mat using the tutorial I posted at Sew We Quilt. You can find the link in my side bar. Here is the finished mat ready to use or to give as a gift.